If wineries were rocket ships, Maison Bleue would have reached the moon in record time. Jon Martinez, who runs the show, has ramped up production, identified better and better vineyard sources, and honed his distinctive style in a remarkably short amount of time, making giant strides with each new vintage. Focused on white and red varietal wines and blends from Rhône grapes, Maison Bleue’s production will ramp up to 3500 cases in 2011 and 4500 this year. Martinez, who appears calm, is clearly a man who has mastered the 36 hour day, as he does the winemaking and marketing of all his wines with a staff of two – a cellarmaster and... himself. 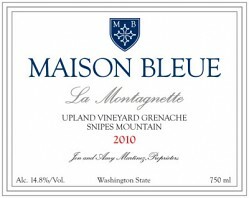 Though much of his production is sold either direct or in the Seattle market, Maison Bleue has become something of a phenomenon in New York, and other national markets are clamoring for the wines also. They are distinctive, immaculate, fragrant, complex, evocative, one might even say definitive wines – and they sell for a fraction of what competitors of comparable quality generally charge. In a preview of brand new and upcoming releases, it was clear that Martinez keeps improving, setting a higher and higher standard for himself and his wines. These three – the latest to appear – are essential for anyone’s cellar. Simply superb. Full reviews and scores will be published in the Wine Enthusiast later this spring, but quantities are limited, so the best advice is get them now. A vibrant, flashy, fruit-laden nose introduces this lively GSM-style blend. The three component grapes all contribute different red, blue and purple berry flavors, nicely wound together with supporting acidity. Displaying superb aromatics as always with Maison Bleue wines, this lacy, fine-tuned Grenache is still a bit raw. One gets the feeling that as good as the juicy young grape and berry flavors are, this wine has more complexity lurking below the surface. Berry, mineral and bright spices elevate the finish, much like a youthful Montsant. After 24+ hours of breathing, it was better than ever. Clover, white pepper, and a whiff of animal make this already compelling, but on the second day it was significantly better. The aromas move through a gorgeous spectrum of flower, spice, fruit and animal. This has tremendous length and aging potential. I Love Masion Bleue wines & of course that means I love Jon, too. Really, I openly dislike almost every bottle of white wine I taste in Washington, but Jon's white wines are a real exception for me. Jon is extraordinarily humble and calm. One gets tired of gimicky personalities and arogance working in the wine biz. Jon's demeanor is quite refreshing! - Melanie L.
So true Paul. Jon's wines show such refreshing fruit and complexity...a rare gem in Washington State. We are very lucky to have him the Yakima Valley. all in my cellar and will add more on new release. Great stuff Jon! What's fanscinating to me about Jon's wine is their knock your socks off fruit, clarity and complexity even though he has to release them so early to meet demand. I was lucky to discover Jon early, so my cellars is stocked with 2008's and 2009's. The '08s are losing their baby fat and revealing true potential now. 09's are just now coming into form, but will improve. Of the ones reviewed here, I've drank the 2010 Jaja and think in needs another year of bottle time, if you can wait.